Yes indeed, folks, clients are fed up with being treated like ATMs. Many (39%) are clearly caught in relationships where the only conversation they can get from their provider is centered on how they can pony up more dough. Whats more, a similar number (35%) still rankle at not receiving the delights they were promised during the courtship phase. Simply put, far too many service buyers feel they have been sold down the river and are getting increasingly frustrated with the lack of focus from their service provider on delivering value and quality. 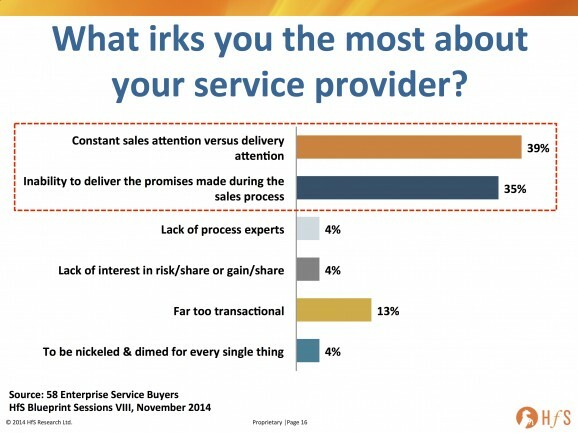 This is why so many service buyers are holding back from taking their outsourcing relationships to a more intimate level with their service providers - they simply do not trust the intentions of their account manager to do anything but drill them for more revenue. It's not that they don't like their account managers, it's simply that they always feel like they are being sold to. We're seeing this happening in many situations, where too many service buyers are feeling burned and want a different type of relationship. Service providers simply have to start taking a very different approach to growing their current relationships - it's just becoming increasingly unsustainable to keep finding more onshore bodies to be displaced into offshore centers at high margins - those days are fading, especially with mature enterprises which have now outsourced pretty much all the low-hanging-fruit transactional stuff. Service providers need to sell their clients by showing how they can save them money on a process/function, that doesn't only involve more labor arbitrage, in order to be given more processes to take on. Yes, it may be cannibalistic for a provider to automate their client's accounts payable processes and take a hit on the margins on the labor supply, but if they can prove they can deliver a transformative model in one area, surely their client will give them more areas with which to run similar efforts? Service providers need to approach their clients with new ways of doing things, which may not be immediately lucrative for them, but is the way to win their trust - to show them they are agents of value, not simply devils of extracting low-value margins. And why should smart service providers take a risk by cannibalizing their own labor model? Because if they don't, eventually one of their competitors will. Because the way outsourcing is being priced and delivered is changing - and many clients are wising up to the shift. There's already a host of stagnating legacy ITO providers grimly limping along on life-support today because they failed to get with the program - and this population of walking-dead providers is only going to increase as more of them fail to evolve the model. 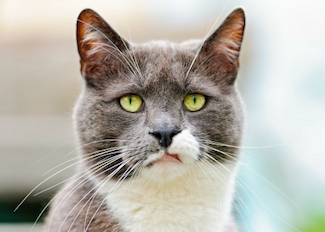 Don't blame the account managers - they are just doing what they are instructed to do. The issue is with the service firms leadership - they just want to keep chasing revenue the easy way selling more butts on seats! Excellent piece of analysis, Phil, and completely mirrors what we have experienced. Account managers need to be more consultative in nature and listen to what their clients need. I just don't see providers investing in those types of people. Very insightful and you have hit on some of the key areas where the outsourcing industry needs to make some urgent changes. 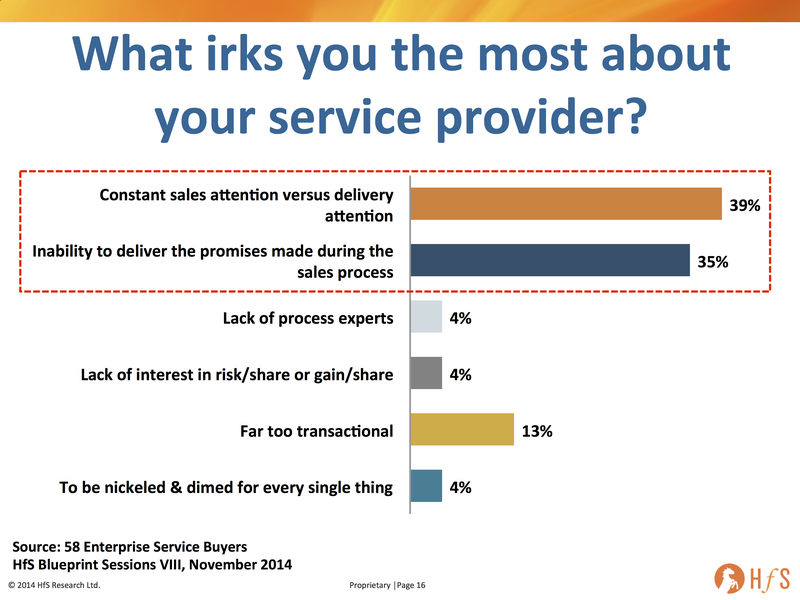 The failure to deliver on promises made during the sales process concerns me the most. Very true! Part of the issue is the disconnect between expectations that may be set during pre-sales or early negotiations vs. what ends up in the contract. "... Leaders in this market, in a few short years, will be technology-led providers with value-based services weaved-in, whose models are based on driving sustained cost-reduction and business value into their clients." Phil, I couldn't agree more. Really spot on - when an outsourcing relationship gets to the BAU-stage there is the constant temptation to go to the customer with a new 'story'. Increasingly however this needs to be less about than 'who else can be outsourced', and more about 'how can process be improved'. Oh, and not to wait until the contract is six months from renewal to do so! Funny, but not surprisingly, this still is a prob. Add a 'Spirit of the contract' appendix. Provider side: AM KPI (during contract period) part of AM bonus instead of Contract value only. Understand the objective of the client and why they want to outsource and expected outcome. Absolutely agree! It's the one thing that really annoys and puts many people off using offshoring. "Service providers need to approach their clients with new ways of doing things, which may not be immediately lucrative for them, but is the way to win their trust"
Phil, congratulations for the article ! Your text seems to be especially valid for some "traditional" providers, whose main objective seems to be their short-term ("next quarter") revenue, although their formal speech is full of expressions like "strategic partnership", "value added", etc. In the new "as a service" economy, this dichotomy between speech vs attitude will no more be tolerated by the buyer organizations. This will be one of the main components which will decide who will survive and grow and those which will fail and disappear. I agree... No one likes to "be sold" and no one is happy when commitments aren't delivered. Providers who continually prove themselves will get more opportunities to partner and grow with their clients. As we talk about delivering more and more value however, it's important and necessary for clients to think differently and embrace the value ideas/solutions as well. Often delivering high value requires a bit of change on both sides. ???? Phil, a great article, and I really enjoy the fact that HfS just says what everyone else thinks, but is afraid to say in public. Well done. I always say - "bad deals start with sales and flow down hill (into delivery)", and if the person at the front door does not have experienced technical and PM skills, or is replaced by low-level employees which is often the case, that slippery slope of dissatisfaction may have already begun (depending on how the engagement is agreed upon). The other thing is knowing when to say no. While it does not happen that often, any experienced sales or account executive knows when the relationship is just "not jiving" and when they are better off listening to the nagging little angel-voice on their shoulder. Maybe pulling out or saying no is the right answer at times. If the shoe does not fit - on either side of the beginning of a services relationship, do not tie the laces! Trust your gut! And do better services as a result for the the ones that DO FIT. Really interesting article and reinforces what many of us have been saying. I think that both parties can take a part in changing the operating model. Where there are risk/reward models or even JV, the emphasis moves towards common benefit. These may work because they require a change in the contractual arrangement. In my experience the traditional contract drafting and legal negotiation of contract terms reinforce the behaviours that you illustrate. If you are working with a 300 page contract how can that encourage the entrepreneurial and transformational behaviours that the client seeks and the provider may want to supply. For this reason, the smaller providers may have a benefit in that they can adapt and change the legal constraints, but only if the client can also adopt a different approach to the legal 'stag fight'. This is exactly the missing link between relationship building (and maintenance) and revenue generation. What prevails in times of hitting targets, meeting ends (quarter and year), more more more is clear but obviously not what customers want. Even a B2B customer is not simply a "wallet" - oh what a surprise for some. So what’s the core motive behind Sales BS? Top line growth means better stock performance of service providers and that’s what investors are looking for. I wonder if the solution is a hybrid between pure play captive and Arm’s-length supplier. Are clients ready to make an investment in a start-up company who is going to change the paradigm by creating true as-a-service set-up? A win-win for both sides. Thanks Phil for sharing this article. Clients will continue to have access to a wide range of options from competitors. Eventually it will zero down to what everyone wants, a good customer experience when buying your services.